Everyone remembers the story of Goldilocks and the Three Bears. It's the story of a little girl who (quite rudely!) barged uninvited into the home of an unsuspecting family of bears: a mom bear, a dad bear, and a baby bear. The bears were out, so Goldilocks decided to help herself to the homey comforts of the bears' domain. She was hungry, so she ate some of the porridge that was already laid out in individual servings on the table. She found one serving to be too hot, and another to be too cold. But the third serving was just right, and she wolfed it down. After eating she wandered into the living room, and decided to sit for a spell. There was a chair for each of the bears, and she tried each one. Once again, only one chair was just right. Then sleepy, she climbed the stairs to the bedroom for a nap. And she found one bed too hard, and another too soft. But one was just right, and she snuggled in for a nice nap. When you're planning your Christmas lighting displays, you might yourself duplicating Goldilocks' experience - less the bears, chairs, porridge and beds. You'll likely find that some bulbs will be too large for certain purposes, and some will be too small. But some will be just right. C6 LED Christmas light sets represent the mid-range of LED bulbs in terms of size. And for that reason they sometimes tend to fall from consideration. The larger C7 and C9 bulbs tend to be chosen more for outdoor lighting displays. 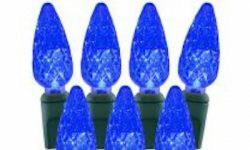 And smaller bulbs like the M5s and 5 mm Wide Angle Conicals are more likely to be selected for foliage lighting and indoor Christmas tree lighting. Outdoor and Indoor foliage: Whether used as trunk wraps, canopy lighting, or scattered throughout foliage, C6 sets can make for a very impressive display. The impact is greater than that of the smaller lights often used for such applications, but not overwhelming, as might be the case with the larger C7 and C9 bulbs. Christmas trees, wreaths and garlands: Again, C6 sets can offer a just-right compromise between big and small. The bulbs are large enough to provide a striking decorative touch without overpowering the delicate beauty of the foliage. Perimeter lighting: C9 bulbs, and to a lesser degree, C7s are the overwhelmingly popular choice for outdoors perimeter lighting. No doubt the large bulbs with their big, bold touch are a great choice for this purpose. But the C6 can also be very effective when applied properly. The bulbs on C6 stringer sets are typically much closer together than the bulbs on C7 or C9 light line. And that closer spacing can result in dramatic, sharp and distinctive lines for your perimeter display. The C6 LED bulbs will use less energy, too. It seems to be human nature to go all big (like c7s and c9s) or all small (like mini-lights). That's probably because it's simply easier to just follow a rote standard: big lights for outdoors, for example, or small lights for indoors. But the best results are always achieved when a little effort is applied to finding the just-right solution. That's true for chairs, porridge and beds. And it's true for LED Christmas lights, too.